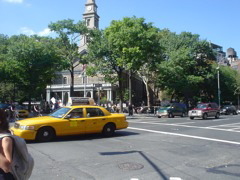 1 September 2001 Behind that taxi cab is a bike block drum circle and party in front of St. Mark's church. More than 200 bikers were arrested in front of that church after Friday's Critical Mass. 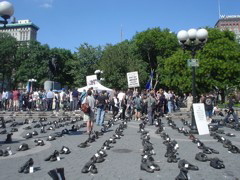 1 September 2004 Eyes Wide Open is a show of one pair of combat boots for every soldier killed in Iraq. 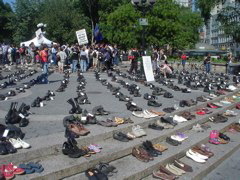 There were 987 pairs of boots out in Union Square Park. 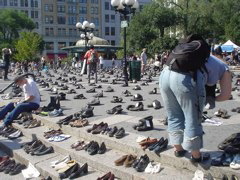 The 1000 civilian shoes represent a tiny fraction of the more than 13000 killed Iraqi civilians. 1 September 2004 They were reading the name, home town, and age of the soldiers killed. 21, 22, 25. I nearly cried. 1 September 2004 Eyes Wide Open. There's a counter protester there. 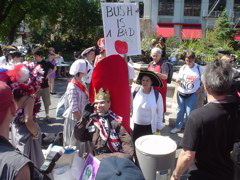 His sign says, "aside from ending slavery, fascism, nazism and communism, war has never solved anything." Yes, all wars are equal. And there are no more fascists anywhere in the world because their idea was put on trial in Numberg and then hanged, and now is impossible to be thought by anybody. And, boy, Regan's nuclear war against communism was a doozy, but now all people's wars are at an end, except in Columbia, Nepal and . . . nevermind. 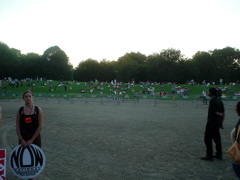 1 September 2004 We showed up over an hour early for the NOW rally so we could lie on the grass. 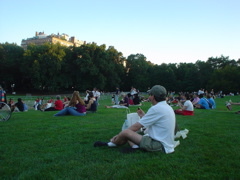 Lying on the grass was unpermitted. We were supossed to be in the pens. But no arrests were made, as far as I know. 1 September 2004 The pen layout was a confusing labrinth. some attedants had to walk more than 10 blocks out of the way to get in. The entrance right behind the rally was penned closed. 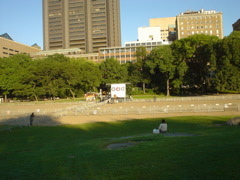 1 September 2004 The NOW rally is going to start soon. I complied with instructions to move into the pen, but most atendees ignored them. I had been wondering why there was almost no queer content in any protests, especially since Bush is scapegoating queers. All the queer content was at the very lesbian NOW rally. 2 September 2004 Cola showed me how the shiny part on the front of my camera is actually a mirror so I can take my own picture. 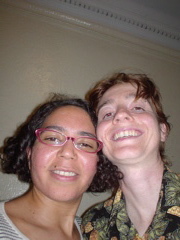 2 September 2004 After a hard day protesting (2 events) and going to the Met, Nicole and I helped Jess move. 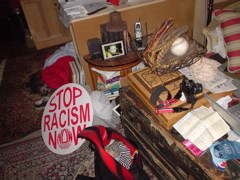 2 September 2004 I nabbed a sign from the NOW rally. It's a durable sign. I should return it. 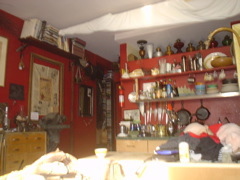 My stuff has colonized Rebbie's apartment. 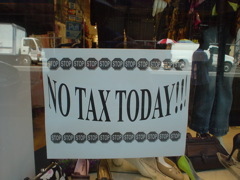 2 September 2004 No tax in New York state all week!!! So Republicans can shop while they're in town and not pay taxes (they're not used to having to pay them anymore) and give NOTHING back to the state and city government funds which they depleted by using massive police resources. 2 September 2004 Union Square was full of people protesting. Vetrans for Peace, mostly. Helicopters hovered overhead. And the ploice blimb, which has snipers in it. You never know when vetrans for peace might get out of hand. 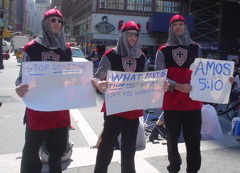 2 August 2004 If these guys are in costume as knights, is it to lampoon the idea of a holy war or crusade against the Middle East? Then why are they holding bible quotes? 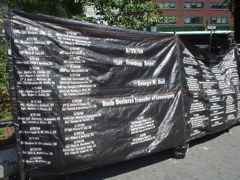 2 September 2004 Names of the dead from the Iraq war. And a quote from Bush: "Let Freedom Reign." I saw RNC delegates on TV holding signs that said that. Not "ring," so that everyone can hear it, but "reign" so it's imposed upon you like a monarchy. 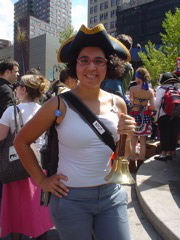 2 August 2004 A patriot group is reneacting portions of the revolutionary war, to overthrow "King George II." they did a Paul Rever's ride last Thursday. 2 Septembber 2004 Nivole and I showed up to participate with RingOut. We were the town criers and did some bell ringing. 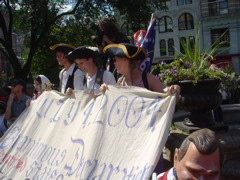 2 August 2004 Only July 4, 2004, the group drew up a declaration iof independance, listing greviances against Bush. They got people in the aprt to sign their declaration. 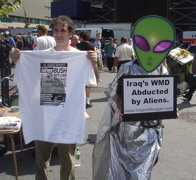 2 September 2004 "Iraq's WMD Abducted by Aliens. www.insaneReagan.com" in Union Square Park. 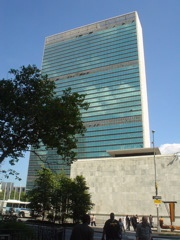 2 September 2004 Then, we walked down to look at the UN. I think the UN is such a great idea. 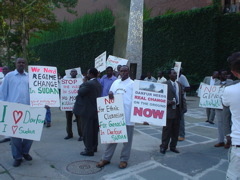 2 September 2004 There was a group of men across the street from the UN, protesting genocide in Darfur. 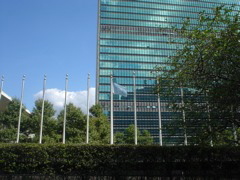 2 September 2004 Only the UN flag was flying, not any of the member country flags. 2 September 2004 They have a sculpture by a guy I like. And they have UN cops. Who are just like everyother goddamn cop. 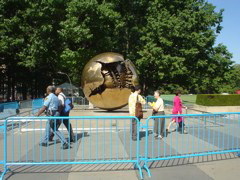 It's illegal to wear any protest material on the UN grounds. 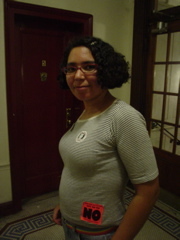 they made me peel off every sticker and take off every button and when I forgot that I had one on my back, the acted as if I was trying to overthrow the UN or something. I hate cops now. 2 September 2004 T%he Sudan protesters from across the street, after deciding I didn't want to hang around the no-free-speech zone of the UN right then. 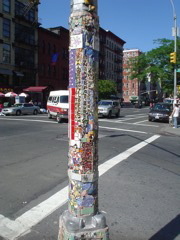 2 September 2004 Most NYers are pissed at Republicans. And with them exploiting 911 and hassling women in the subways, I can see why. 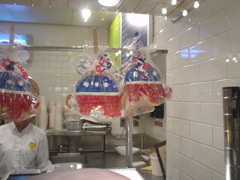 But in Grand Central Station, they made republicans cookies. Maybe it's satisfying to bite their heads off. 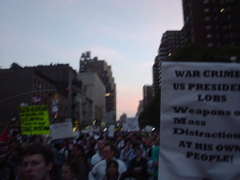 2 September 2004 I saw chalk on the ground saying that all the cool kids were going to protest at Madison Square Garden, so I ditched out of the Not In Our Name protest to go to the ANSWER Coalition protest and be more badass. 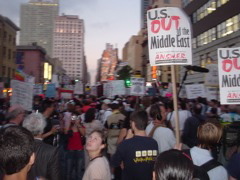 2 September 2004 The ANSWER protest spanne dmore than three blocks and kept growing until the cops ordered us to disperse. There were huge hilcopters overhead. And the police blimp.